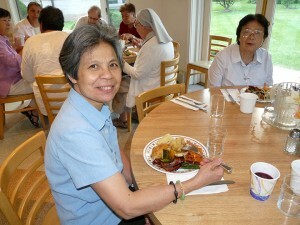 As Handmaids of the Sacred Heart of Jesus, we are nourished and enriched by our community. We are brought together and become “family” because of our shared spirituality and desire to serve Jesus Christ by repairing broken relationships and rebuilding society. We become more compassionate, loving, and grace-filled by living, praying, and working together than we could ever do on our own. One of the most significant aspects of being a Handmaid involves daily Adoration of the Blessed Sacrament. Our Sisters have prayed in Adoration since the founding of the Handmaids. We were founded in Spain in the 19th century, during a time when the faith seemed to be under fire and more and more people were leaving the Church. Our Foundresses believed that loving Jesus in the Blessed Sacrament and honoring Him by prayer before the Blessed Sacrament were ways to help remedy this situation. Today, we continue to be women of Eucharist. 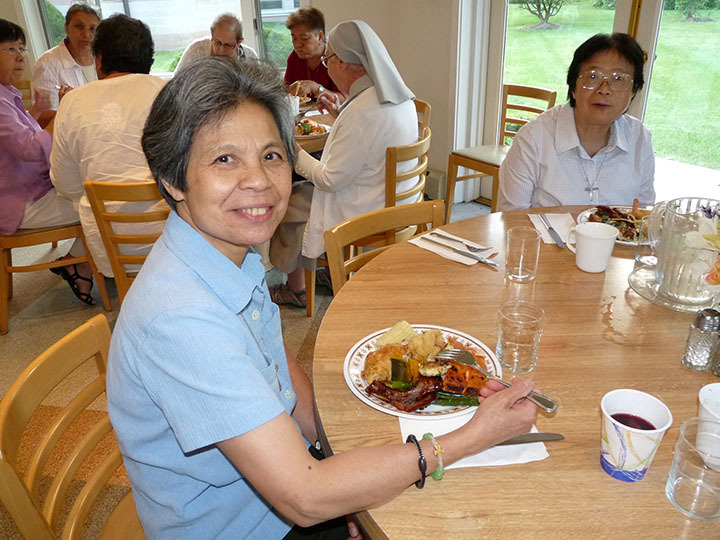 Our daily prayer includes an hour of personal prayer according to each Sister’s prayer style and preferences, an hour of Adoration of the Blessed Sacrament, daily Mass, and the divine office prayed in community (morning and evening). Adoration brings us together as a community. We take turns in our chapels and churches adoring the Lord, and this constant return to our center means that our center of gravity is our community life. Adoration marks our Eucharistic spirituality. Adoration is an extension of the Eucharistic celebration, an extension of the celebration of Mass. Adoration is profoundly ecclesial. We love the Church, without whom we could not have this type of prayer. The sacramental life of the Church is central to our prayer and ministry. Adoration is part of our apostolate. We desire to “put Jesus Christ for the Adoration of the peoples,” as our foundress, St. Raphaela Mary, stated. We have exposition of the Blessed Sacrament in our school and retreat house, and we invite people into our chapels to pay a visit to the Lord. Adoration reminds us of the “Eucharistic attitudes” that mark the gift of the Eucharist: joy, hospitality, simplicity, humility, and compassion. It inspires us to give all that we have and are in daily acts of forgiveness, peacemaking, and justice. Adoration brings our apostolate into our prayer lives. It is our time to present the needs of the world to the Lord. Adoration is time to be closely united to our Lord and gaze on Him with love…and to allow ourselves to be gazed at in love. Adoration is universal like the Church: at any time of the day or night, a Handmaid somewhere in the world is making her Adoration. We feel connected to one another knowing that our Adoration is shared and perpetual. Adoration is eschatological: it is a foretelling of what we will be delighted to do in Heaven… see God face-to-face. Adoration is needed in our world: in a society that is busy, loud, and almost frantic in its rhythm, time away with the Lord is very important! Adoration is centered on the person of Jesus Christ. The prayer of adoration honors and adores Jesus and puts us in contact with Him. Why do we adore? Because we are amazed by Jesus, by His Sacred Heart, and we need to learn from Him how to be women who share His values and actions. Eucharistic adoration is for the Handmaids worship, communication, apostolate, and formation. If you are a young woman open to God’s call in your life and you feel called to this style of prayer, we invite you to consider becoming a Handmaid.